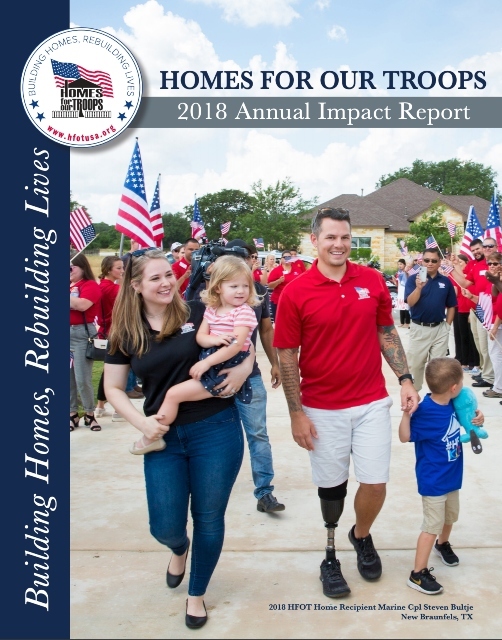 Homes For Our Troops (HFOT) is a publicly funded 501(c) (3) nonprofit organization that builds and donates specially adapted custom homes nationwide for severely injured post – 9/11 Veterans, to enable them to rebuild their lives. Most of these Veterans have sustained injuries including multiple limb amputations, partial or full paralysis, and/or severe traumatic brain injury (TBI). These homes restore some of the freedom and independence our Veterans sacrificed while defending our country, and enable them to focus on their family, recovery, and rebuilding their lives. Since its inception in 2004, nearly 90 cents out of every dollar spent has gone directly to our program services for Veterans. HFOT builds these homes where the Veteran chooses to live, and continues its relationship with the Veterans after home delivery to assist them with rebuilding their lives. Our tag line is “Building Homes, Rebuilding Lives”. Rebuilding Lives is the most important aspect of our mission, therefore, we stay with our Veterans after home delivery. Homes For Our Troops provides a pro-bono financial planner for three years to assist in financial planning and household budgeting, in addition to homeownership education and warranty coverage to ensure that the Veteran is set up for long-term success as a homeowner. One staff section’s sole focus is following up with our Veterans, and we also have a peer mentoring program consisting of Veterans and spouses in the HFOT program. To improve our post home delivery support, we continue to expand our network of non-profits, corporations, and government entities to provide assistance with employment, education, training, health, and other issues. We strive to provide the linkage between the Veteran and the assistance he or she needs. Other differences include a comprehensive selection process, building where the Veteran wants to live, and spending nearly 90 cents on the dollar to support the Veterans since our inception in 2004. HFOT builds homes as a pivotal point for these Veterans to rebuild their lives, and once again become highly productive members of society. Despite their life-altering injuries, many of our Veterans have embarked on new careers, completed their college degrees, or started families. Empowered by the freedom a donated specially adapted custom home brings, these Veterans can now focus on their recovery and returning to their life’s work of serving others. Many have embraced their roles as motivational speakers, sharing their messages of persevering through tragedy with groups and classrooms around the country; others take to a national platform to promote awareness of Veteran suicide, homelessness and PTSD. Their incredible stories – far too numerous to include on one page – are the driving force for the work we do here at HFOT. We encourage you to read more about their amazing stories in this website. Since 2004, HFOT has built over 270 specially adapted homes nationwide. Our goal is to build a home for every Veteran who qualifies for one of our specially adapted homes. View our active project list. Charity Watch has awarded HFOT an A rating and has included us on its list of Top-Rated Military & Veterans Charities. Additionally, HFOT is a platinum-level Guidestar participant, demonstrating its commitment to transparency, meets all 20 criteria of the Better Business Bureau Wise Giving Alliance, and has a 3 Star rating with Charity Navigator. Learn more. Please be aware, Homes For Our Troops does not make calls to solicit donations. HFOT has more than 100 Veterans in the application process for our program from severely injured Veterans. 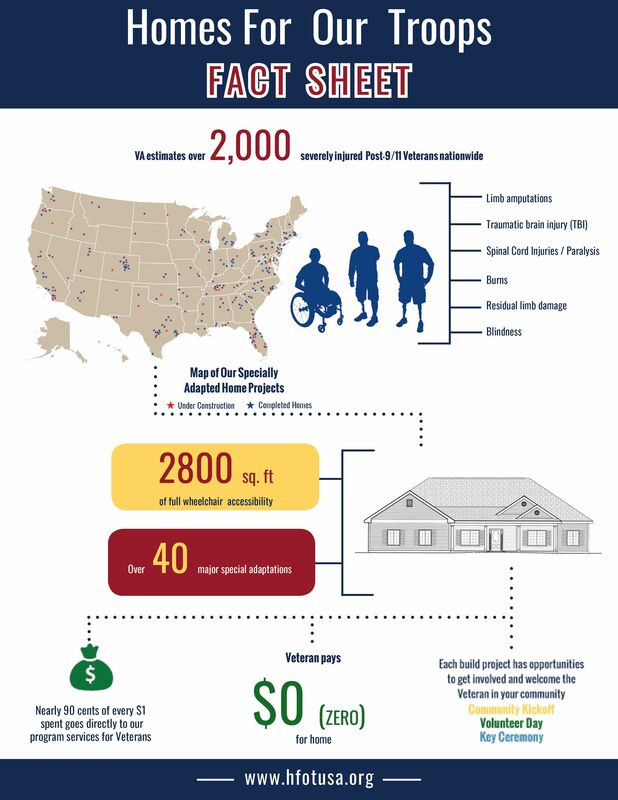 As a top-rated military and Veterans’ nonprofit organization, Homes For Our Troops relies on the generosity of donors like you. Homes For Our Troops is a publicly funded non-profit, with approximately 65 percent of our operational budget generated by individual donors, private and family foundations, and community fundraisers nationwide who step up to help our American Veterans by coordinating everything from lemonade stands to golf tournaments. The remaining 35 percent comes from corporate supporters in the form of cash and donated materials. Please DONATE TODAY or see how you can help us by calling (866) 787-6677. Our Core Values reaffirm our commitment to the Veterans we are privileged to serve, as well as our donors, volunteers and supporters. The HFOT staff is dedicated to these values: COMMITMENT, ACCOUNTABILITY, RESPECT, EXCELLENCE, and SERVICE.